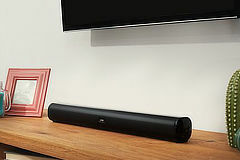 This sound bar has a compact design that's compatible with TVs from 22” and over, so that you can enhance your audio no matter the size of your TV. And bluetooth connectivity lets you wirelessly play music. The prize draw closes on 12th January at 8.30pm.